The Mr. Coffee ECMP1000 Café Barista Premium Espresso/Cappuccino System is one of those top-notch espresso machines that may possibly fulfill your desire for the perfect espresso machine. That is why we’ve compiled this complete review of the Mr. Coffee Café Barista Espresso Machine, so read on to find out what it is all about. That is why we’ve compiled this complete review of the Mr. Coffee Café Barista Espresso Machine, so read on to find out what its all about. The Mr. Coffee Cafe Barista is also on our list of top best espresso machines of 2019. The Café Barista is truly a unique espresso machine and here is why. The minimalistic design of the Café Barista makes it a well-balanced machine with a sleek look. The best part about the stainless steel front is that polishing this machine is a pleasure with ease. 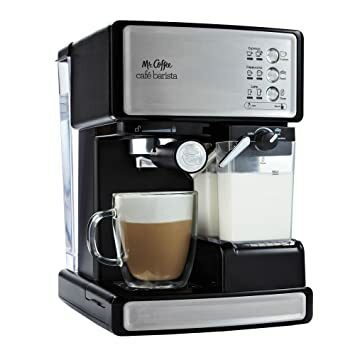 The Mr. Coffee ECMP1000 Café Barista Premium Espresso/Cappuccino System is complete with a simple, yet innovative automatic milk frother that takes the complex guesswork out of steaming and frothing milk for lattes, cappuccinos, and other similar espresso drinks. The user-friendly control panel makes brewing simple even for first-time espresso machine users. The indicator lights let you simply confirm your choice as you click on your desired drink choice. Measuring at 12 x 14 x 12.2 inches, this compact Mr. Coffee Café Barista is attractive enough to blend in with the backsplash of a modern kitchen counter. What may suit one person may not necessarily suit another. The Mr. Coffee ECMP1000 Café Barista Premium Espresso/Cappuccino System does have a noticeable girth for a good reason. The special reservoir for the milk is completely removable and features a built-in wand for steaming when attached to the brewer and can easily be stored in the fridge for the next time you decide to use it. The stainless steel Mr. Coffee ECMP1000 Café Barista Premium Espresso/Cappuccino System comes with a Porta Filter, allowing you to both brew shots and load the machine with grounds. In other words, it’s a metal filter attached to a sturdy handle that must be locked tightly into place under the Barista’s brew head. The ECMP1000 Café Barista also includes two filter baskets allowing you to choose from serving either a single shot or a double shot of espresso. Right underneath the brew head, there is a pair of sliding drop trays that accommodate either large or small glasses and cups. Moreover, the pair of drip trays on the Café Barista are removable for both emptying and cleaning. The ECMP1000 Café Barista is equipped with the 15-bar pressure that makes this machine a real powerhouse when it comes down to delivering the most satisfactory cup of espresso. Compare this to the optimum pressure for an average espresso machine of around 8 to 10 bars. I personally love the taste of the espresso produced with the 15 bar pressure and so do most of the reviewers of the ECMP1000 Café Barista. The result of using quality beans with this product is top notch quality espresso. For a much creamier look on the espresso, try storing your beans in a simple container and grinding them fresh before making the drinks. There are three stainless steel buttons on the ECMP1000 Café Barista. Each button has three functions. In other words, the entire panel has nine different functions. The functions are divided into two parts. The left side of the buttons is for the automatic selection of either single or double shots. Moreover, the right side of the buttons is meant for the manual features. Such features include extra froth or cleaning. The buttons on the espresso machine are surrounded by an intuitive green LED light that lights up or flashes depending on the current step in the cycle. There are additional small icons below the three main buttons. These small icons illuminate when a button is pressed in order to guide you to the espresso drink of your desire. Coffee grounds are poured into the Porta Filter. Thereafter, you have to tamp the coffee grounds with the included measuring scoop and tamper. Next, the Porta Filter is placed back into its proper position and carefully turned so that it locks properly. A snapping noise will confirm that you properly placed the Porta Filter on the Café Barista. After placing the Porta Filter in its place, your next step would be to choose the amount of froth on your espresso. A Froth Control Knob is used for the purpose of choosing the amount of froth based on how much the knob is turned from left to right. If you are not satisfied with the froth produced after turning the Froth Control Knob all the way up, you may simply push and hold the Cappuccino button for a couple of seconds and more froth will be produced. The last step is to select your preferred Espresso Drink and push one time for a single shot of espresso or press twice for a double shot of espresso. When it comes to cleaning an espresso machine, the Mr. Coffee Café Barista Premium Espresso Machine beats them all. In the manual book of the Barista Espresso Machine, it states that all parts except the Porta Filter and the water reservoir are dishwasher safe. 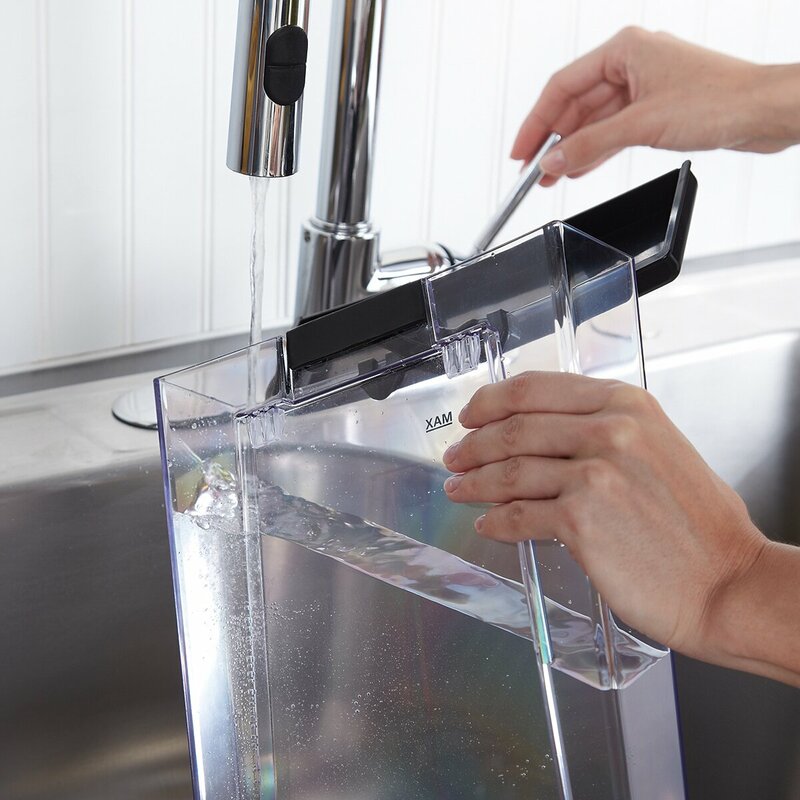 The Porta Filter and the water tank are cleaned with warm water and some dishwasher soap. Note, a cleaning cycle must be run after using the Frothed Milk Dispensing Tube after you are done. This process is easy, do not worry. First off, make sure that you have a cup of some sort to retain the water that will proceed from the tube. Make sure there is water in the water reservoir. Now, turn the Froth Control Knob to ‘Clean’ and simply hold the Latte/Clean button for about 5 seconds and wait for the magic to happen. Its as simple as that when it comes to cleaning the Mr. Coffee Café Barista Premium Espresso Machine. Water Reservoir leaks at times: This occurs when the user does not snap the reservoir into place completely. However, in some cases, this issue has been associated with a small manufacturing flaw in the gasket. Milk Reservoir Leaks: This also occurs when the user forgets to push the milk reservoir completely into place, but once again, it is sometimes caused by a manufacturing flaw. This is not to say that all machines come with a manufacturing flaw. This is only in some rare cases. Too loud: There is a relatively loud gurgling noise when the machine steams the milk. Loss of pressure after 12 to 14 months: Some users noted that after over a year use of the Café Barista Premium Espresso Machine, it has lost pressure. However, most users that face this issue have no issue in purchasing another one if this does happen. Most users of the Mr. Coffee Café Barista Premium Espresso Machine are completely satisfied with the way this machine functions. As an owner of one of these, I have not had any issues with this machine. But we cannot dismiss some of the issues that a minority of the users have with this machine. The Mr. Coffee ECMP1000 Café Barista Premium Espresso/Cappuccino System is one of my most favorite espresso machines. Reviewing the Café Barista Premium Espresso Machine has definitely been a pleasure of mine. This machine has saved me so much money! I hate spending $5 for a coffee at a Starbucks or at a small coffee shop. I find it that its compact, sleek profile design makes it a joy to operate. The best part about Café Barista Premium Espresso Machine is that it does not require much effort on the user’s part. Not to mention the recipe booklet that comes with this espresso machine, the instructions on how to operate the Barista Premium Espresso Machine are simple and concise. The water reservoir and its functionality add a delightful touch and only a few users have mentioned an issue with it. The simplicity of this machine puts it under the category of the ‘Best Espresso Machine under $500.’ I hope you enjoyed this review of the Mr. Coffee ECMP1000 Café Barista Premium Espresso/Cappuccino System enough to share with your friends. 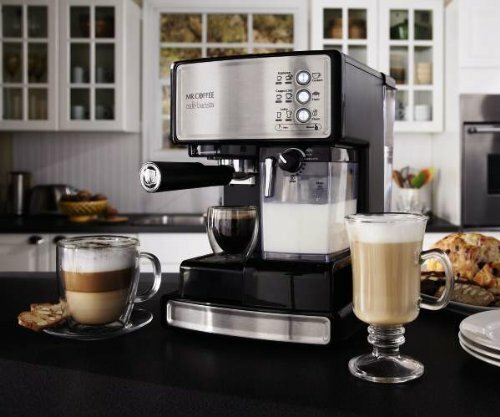 Without a doubt, you will not regret purchasing The Mr. Coffee ECMP1000 Café Barista Premium Espresso/Cappuccino System. As a personal user of this product, it has saved me tons of money. I no longer go out to buy coffee. I’ve enjoyed each cup of coffee/latte/cappuccino that this machine produced and I believe you will too!